Your business is established but could do better — so what do you do? Nail the door shut! That’s crazy right? But that’s what businesses do when they ignore their website. 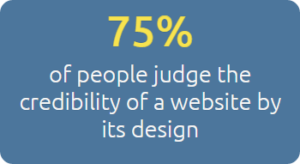 According to a study by Stanford University 75 percent of people judge the credibility of a website by its design. And 80 percent of B2B sales are decided before a prospect talks to a salesperson. When you look lousy online, your prospects judge your business accordingly. You have eight seconds to put a compelling message across before most users click away and find something else. Eight seconds to drive them deeper into your site. That’s not a lot of time at all! Here’s some of the main reasons why people leave your website — and what to do about it. The first rule is never be boring! Your site has to appeal the moment your visitor arrives. And what you must communicate is what your company does. Don’t make them search for Who Your Are, Contact Us, Sign up for our newsletter — you’re there for them. People notice and appreciate that. The second rule is always update. Why? Customers, and search engines (Google, Bing, Yahoo), demand fresh content to consider you relevant. If your company blog or resources section hasn’t been updated in a month or more, your visitor is going to think you don’t care. If you don’t care enough to maintain your blog, your customer may assume that you don’t care about your product or service. Search engines want to see if you regularly update your site — because that means you’re relevant. If you don’t keep updating your site it drops in rankings over time. A drop in rankings means your customers won’t be able to find you, or they’ll find your competition first. Take two websites that sell healthcare software. One site updates their website on a quarterly or semi-annual basis with new information. The other one updates twice weekly with new information about themselves, about new insights in the industry, and news that is relevant to their niche. If someone types in a question that both sites can answer, the one that updates more often will rank higher. Also, more information on your site gives searchers more access points to your page. Ideally, you should update your site once a month at a minimum. Shoot for once or twice a week for the best results. Who dresses you? Your momma? OK, even a poor site design can draw customers if it is regularly updated…look at craigslist. However, if your competition’s website looks and performs better than yours, you’re going to lose market share. So drop the big hair and look sharp. And to look sharp — you have to look sharp on all devices. Today, the Number One cause of site failure is a lack of responsiveness. Responsiveness is the ability of a website to display itself differently depending on the device viewing it. It responds to whether the user is viewing from a desktop, a tablet, or a mobile device. More and more people only use their tablets and smartphones to browse the net. If your site doesn’t look appealing on those devices they’ll go to someone else whose site looks and functions better. Grab someone on your staff with a smartphone and a tablet and have a look around on your website. Are you looking good, or like you’re on the way to your high school prom? By now, you should be getting the message you need to update your content (text, infographics, video, images). Many businesses are afraid to update their site because they have no idea how to do it without breaking it. Usually, that is because they have a poor content management system (CMS). CMS systems like WordPress help webmasters keep sites updated and upgraded with new features. The best way to overcome your fear is to consider switching to a more stable CMS. WordPress, Joomla, and Drupal are currently three of the most popular CMS systems. OK, you know your site has to capture the attention of a visitor — what next? People view websites as knowledge centers about a company, and they expect to find the information they want quickly and with minimum fuss. If your site is too difficult for them to navigate or if they can’t find the answers to their questions they’ll go to a competitor that can. Today’s customers won’t feel comfortable calling your company or filling out a contact form unless they can gather enough data for them to trust you. Visitors don’t want to look at a site full of sales language. Too much sales and marketing language and they go to the back button. Instead, your goal should be to educate your visitor about your business, and express your thoughts about issues surrounding your industry. Give visitors interesting and relevant information and they will stick around, have greater respect for your business, and are much more likely to convert. Making a site that looks modern, doesn’t bore people, and gives people the information they need is a real challenge. However, it’s part of the cost of doing business in the online world. Static websites don’t serve the needs of the modern internet user. If your site is failing in any one of these aspects, it’s time to pry the nails out of your front door and welcome people. And capture all that business you’ve been driving away. Jeff Neasmith is Troon’s digital marketing guru. His previous experience includes launching, marketing and selling successful enterprise and retail software solutions like Vivonet, Cayenta and Yodlee.